And it’s all about pouring your heart into something that means the world to you and then sharing it and having no guarantee anyone will get it or it will turn into what you hope. One of my greatest personal challenges on my entrepreneurial path has been getting visible. There were days when I would make a post or send out an email and then proceed to curl up in a ball for the rest of the day sure that everyone hated me for it. Yup, it’s been a long journey for me. But now I simply create a strategy that I follow and ignore all the noise in my head and follow my heart and my plan….and do my best to have fun along the way. I have come a long way but I’m still not perfect. There are still days I worry obsessively about what other people think and what is going to happen but most days I just focus on creating and giving. I do my best to live by this Andy Warhol quote…. I know I risk the chance of sounding like your Mother here, “Just be yourself, honey and everyone will love you”. But for real, the more authentically YOU that you are, the better chance you have of being seen and heard by the “right” people. Plus it’s so much easier than trying to be someone you aren’t. Be yourself and be where you are NOW in your journey. Consistency will push you to the next level. You must be consistent in your message and in your marketing efforts. Keep putting yourself out there is the same consistent way each and every day and eventually you will hit a tipping point in your visibility efforts. Stay in action and don’t be afraid to say what you really think and what is really happening with you behind the scenes. Authenticity and vulnerability are bold and they will help your visibility more than any marketing strategy. Show up with value and solutions. People will notice you and respect you if you help them solve a legitimate problem they are facing. Being genuinely helpful will help to attract people and opportunities into your life. Give to others without expectation of anything in return. Offer content upgrades on your website, how can you provide even more value on a subject? Create awesome content- make your content STAND OUT… go big or go home. Don’t spread yourself thin. Broad is broke, riches are in the niches. Being specific with your visibility strategy is crucial to it’s success. You cannot be successful by trying to show up everywhere and be everything to everyone. Determine your niche, your message, your deliverables and your strategy. Be specific, decide and be choosy. Don’t follow a bunch of people online; pick 1-3 people you look up to and follow them, Following too many people will distract you, dilute your message and cause you to go into comparison mode. Being kind and showing up as a friendly face will do wonders for your visibility and your own happiness. Spread joy always. Try new things, let your mind and imagination wander. If you are feeling burnt out or like you have plateaued during a particular activity or strategy try to implement something new that you never even thought would work for you or your business. Be willing to be imperfect. The only way to push a project forward is to put it out there for feedback. Sometimes this requires you to be vulnerable and jump before you are totally “ready”. Being willing to be vulnerable dramatically increases your potential to be visible. Stay on top of what is happening in your market. Keep yourself educated and find new ways to implement best practices. Don’t be afraid to claim your expertise, get your work out there and create meaningful relationships. Let your light shine and be a light for others! 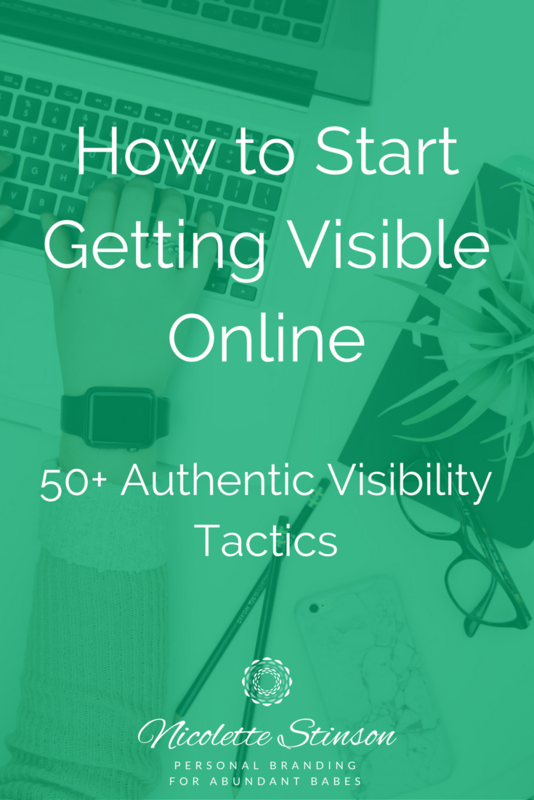 Leave a comment with your favorite 1-3 visibility strategies (listed here or not!) that you are committed to taking action on this week!